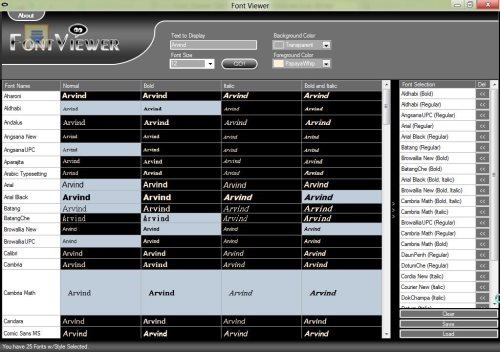 Font Viewer is a free software which allows to easily view all installed fonts on your Windows 8 PC. This Windows 8 font viewer offers all rendered installed and non-installed fonts in a scrollable grid view. Font Viewer in Windows 8 also offers to change background color, size and displayed text all in one touch. Font Viewer is built-in with too many available listed features which lets you to store names in readable and easily accessible form. It also allows to select various listed fonts. Normally, as you are preparing for any project, you want the most impressive and fabulous fonts that’s should be printed to present your project. Then, this free font viewer may help you out. You can also export various list of font viewer file (*.fv) and list of various text file (*.txt). Additionally, you may also export a list of an Adobe Acrobat PDF file(*.pdf) with various settings and style applied to it. Renders all installed and non installed fonts. Exports various list of files. Allows to select various fonts and stores them. It also allows to change the color, size, displayed text and background color. Applies the various styles to the selected text. Safe from adware and malware. Head over to the download link. Font Viewer is a remarkable application to check for various installed and uninstalled fonts on your Windows 8 PC. You can store names in readable and easily accessible form. A must trail recommended ….